Looking for a great conference to attend? 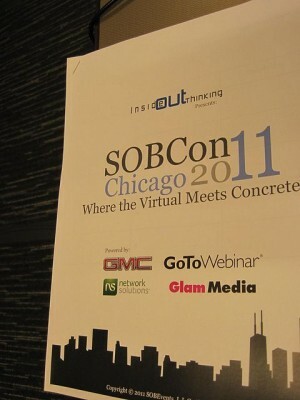 Sign up for the next SOBCON (Successful Online Business) make some great new friends, learn, have fun and enjoy a unique experience. After grappling with how to best describe the SOBCON conference to friends I was encouraging to attend I did what anyone who enjoys a good conversation among friends would do. I planned a SOBCON panel on Blog Talk Radio. After reaching out to some of the people I met at SOBCON 2011 in Chicago I found some great panelists that were ready to join me. Panelists Amber Cleveland, Nacie Carson and Shashi Bellamkonda kicked off the conversation. Nacie and Amber had both been volunteers so they had some nice insights from an insiders perspective. Shashi has participated as a sponsor and panelist and we all had been participants. That is perhaps one of the coolest things about SOBCON, the presenters are integrated into the breakout sessions and participate in the conference. We were fortunate to also be joined by Liz Strauss and Marla Schulman both dialing in to surprise us. The chat was packed with some of our good friends including Angela Maiers and Andrew Marshall and others were listening in and chatting with us via Twitter. Image credit ShashiBellamkonda via Creative Commons. @DvinMsM thanks for sharing that! Hope you're having a great week.